Three Asiatic black bears play at the Free the Bears Fund rescue center in Kuangxi Waterfalls Park near Luang Prabang in northern Laos, August 2017. The capture and trafficking of endangered Asiatic black bears continues to be a problem in Laos, although the government is trying to reduce it. The bears often are sold so their parts can be used in traditional medicine. In early March, officials in northern Laos took three endangered Asiatic Black Bears from villagers who captured the animals. Government officials said the bears were caught when they were cubs. They are now thought to be between five and seven years old. The officials gave the animals to the Free the Bears Fund. The Australian wildlife-protection organization operates in Laos and other Southeast Asian countries. This is not the first time Lao officials have stopped trade in endangered animals. In January, Lao customs officers found five red pandas in containers during a vehicle inspection at the border with China. Three of the five pandas died while being taken to the Free the Bears Fund rescue center in Luang Prabang province. And in July 2017, two Asiatic black bears, only a few weeks old, were put up for sale for $1,800 each in a market in Luang Prabang city. Officials took the animals and donated them to the Free the Bears Fund. Police said a villager in northern Laos caught the bears in a forest after their mother was killed by illegal hunters. Asiatic black bears are called moon bears because of the white-colored markings on their chests. The animals are found across Asia from Iran to Japan. But, their numbers are decreasing because of hunting and the loss of forests where they live. Traffickers can demand large amounts of money for the bears’ gallbladder and bile. These are used in traditional medicines believed to cure many illnesses. The bile helps protect bears from illness during hibernation. It is taken through a painful process in which the animals are drugged and stabbed in the stomach with needles to get at their gallbladders. During the past several years, many rescued bears have been sent to the Free the Bears Fund center in Tat Kuangxi. In August, a British volunteer from the center told Radio Free Asia (RFA) that the center has too many bears and needs to expand. To control the center’s population, the center’s leaders decided to sterilize the bears and requested permission from provincial officials to expand the center. The officials denied the request at first, but later agreed to let the group build in a new place for the bears to live. Sengaloune Vongxay is manager of the center’s Lao Bear Conservation Project. He told RFA that the center is now separating males from female after they reach reproductive age. They are also building a new center that will hold up to 150 rescued bears. “This center will be larger — more than 26 hectares,” he said, adding that the center would be completed later this year or in early 2019. Asiatic black bears inside a cage at a private bear bile farm in Vietnam's southern province of Binh Duong, before being transported to a bear rescue center founded by Animals Asia, Nov. 29, 2011. Forest rangers believe there are still many wild bears in the country’s 24 national protected forests although illegal trafficking continues. One ranger told RFA that more than 200 domesticated bears are currently held in captivity. In March of 2017, the nonprofit group World Animal Protection released a report. 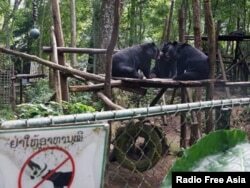 It said 25,000 bears are held in captivity in centers that collect bear bile across Asia. Bear farming for bile or gallbladder removal is legal in South Korea and China, the report said. Vietnam banned bile removal 13 years ago. But, more than 1,000 bears are still held captive there. Asiatic black bears are considered at high risk of endangerment by the Convention on International Trade in Endangered Species of Wild Fauna and Flora. Known as CITES, the treaty aims at protecting endangered plants and animals. Laos became a member of CITES in May 2004. However, Laos remains a place where wildlife trafficking of exotic animals is common. On March 30, Lao and Chinese officials met with Chinese visitors and businesspeople. They warned the group that buying or selling wildlife and ivory is illegal in Laos. This story was originally reported by Radio Free Asia. Phil Dierking adapted this story for VOA Learning English. Mario Ritter was the editor. How do you think countries should protect endangered animals?? We want to hear from you. Write to us in the Comments Section or on our Facebook page.